The result of the Presidential Election was hardly a foregone conclusion, for while the “progressive” candidate won again, it was by a reduced margin. And there were moments when even his own most earnest supporters thought he might lose, given the bad shape of the economy. His opponent, a former state governor with a reputation as a successful common-sense manager, mounted an unexpectedly lively challenge. And the incumbent, though rousing himself for the bigger rallies, seemed listless compared with previous outings. For this large, and apparently captive constituency, the overall economic position was of little interest. Critics might argue that with vast, underexploited resources and many other advantages, the country should not have such high unemployment, such debts and deficits, such slums. The country’s foreign policy was also a scandal: old allies abandoned, new friends adopted of the most questionable sort. And while the incumbent claimed to be a Christian, the more fulsomely as his polls declined, religion and religious freedom were also at issue. The country’s strong Christian heritage seemed, to many of the president’s opponents, to be slipping away, replaced incrementally by a new gospel that fixed religious concern on class inequality. The essence of Christianity, on this view, is Christ’s commitment to taxing the rich to support government welfare programs, and if the fussy and oppressive moral strictures of ageing bishops and scandal-ridden priests should vanish, together with their spiritual hocus-pocus, so much the better. We are discussing the recent Venezuelan election, of course. Hugo Chavez was re-elected president by a margin of almost 10 percent. 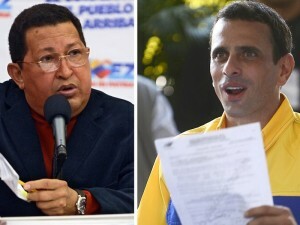 His challenger, Henrique Capriles, accepted defeat with uncommon grace, not immediately challenging the count through the country’s expensive new computerized voting system. Rather, he had focused throughout his campaign on the president’s overwhelming advantage in public media, and on the huge public works projects he’d announced on the eve of the election, to provide political condiments to his voting blocs. Capriles is, incidentally, a devout Catholic. Rosaries and the iconography of Catholicism were much in evidence at his (large) rallies, and the candidate himself was not shy about his religious affiliation. Foreign observers are no longer welcomed, but for this latest election, some 97 percent of eligible voters had been registered – indeed, substantially more voters than human inhabitants in one Chavez-friendly state, and beyond statistical possibility in thirteen others, according to critics. Compare this with a mere 65 percent registered in the USA, where the registration drives are not so advanced. Voter turnout was similarly sky high, among those registered: well above 80 percent, compared with well under 60 percent in the last ten U.S. presidential elections. And while some cynics in, for instance, a peer-reviewed statistical journal, and several independent election monitoring projects, have pointed to suspiciously repeating arbitrary patterns in past election results, which swung support consistently in Chavez’s direction by margins of 10 to 20 percent, the consensus is that by any Third-World standard, Venezuelan elections are gleaming. The Capriles campaign made heroic efforts to monitor voting in all of the quickly multiplying local polling stations. Capriles’ own previous electoral successes had come with tireless monitoring efforts to protect his vote. A more serious issue, according to his camp, was fear over the secrecy of the ballot. Whether or not the computers report back the names and addresses of those who vote against Chavez, everyone remembers that the 2.4 million names on the petition to recall him in 2004 were published by the government, and that campaigns of vilification ensued. While the new computer system is advertised to maintain complete opacity on individual voting preferences, the user who is plainly entering his identity, along with his vote, may be entitled to his doubts. This is a universal issue. As voting systems become more high-tech, fewer and fewer will trust that their ballots are really secret. They are a means for any governing party which relies on large, captive voting blocs, to keep them in line. We turn, thus, from technical questions about the integrity of the count, to deeper issues of political influence and intimidation. Chavez controls the politics of Venezuela through his effective personal control of its oil wealth. And while, since nationalization, the revenues no longer support the sort of private investment that stokes independent wealth, it remains available for growing government welfare schemes (so long as real world oil prices keep climbing faster than the population, and the reserves hold out). According to an observation Mitt Romney let slip, while unaware he was being recorded, 47 percent of the U.S. electorate are now to some degree wards of the state, and increasingly a captive constituency for the Democrat party. In places like Scotland, the proportion of those who receive more in government benefits than they pay in taxes now approaches 90 percent. As the leader of the Scottish Conservative party recently noted (to similar outrage), this explains not only why a people once famed for their industry and frugality have acquired the opposite reputation, but also why the once-mighty Scotch Tories have shrunk to a tiny fossil remnant, while nationalists and socialists vie for the legislative power. And I would add, why Christianity in Scotland has been withering away: for it is systematically replaced by another religion, which worships a different God.